This eye-opening article will make us all realize the importance of our short life here on this Earth. This world is continually wasting people's lives with many vanities, politics, traditions, materialistic sports & entertainment, consumerism, etc. Most of the victims are the youth, stealing their hearts and time with lustful commercials, movies, concerts, soap operas/telenovelas, computer games, mobile texting/chatting, and now the social media networks of the Internet. These modern technologies can be used to achieve the purpose of their spiritual lives if they are wise enough, but they are not, because they are not taught the MESSIANIC KABBALAH WISDOM of God (Psalms 90:12). And as they mindlessly waste the precious hours of their lives, the clock never stop ticktacking until they come to the end of their lives, or the END OF THE WORLD! DO YOU SQUANDER YOUR SHORT LIFE ON THINGS AND ACTIVITIES THAT DON'T PROFIT IN THE NEXT LIFE? The Spirit of God is advising each one of us to spend wisely the very short life given to each one of us. We should use it more in knowing God The Father and His Christ in a personal way. 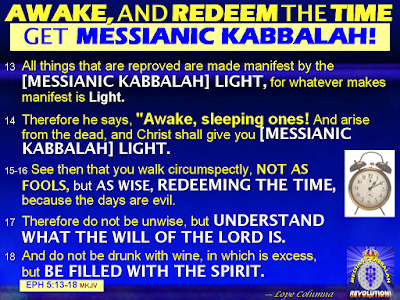 This we can do only by studying God's Wisdom, which is the Messianic Kabbalah Wisdom (Psalms 90:12). Then, after we exit from this world, we have the confidence to face the Father and Christ with the intimate face-to-face relationship and true knowledge about them. And the Father will accept us to enter His Kingdom (John 17:3). If we fail to develop that intimate relationship with the Father, because we spent our life for the material world, then we are sure to be rejected. Why should God the Father allow ignoramus strangers to enter and live in His Kabbalistic Kingdom? 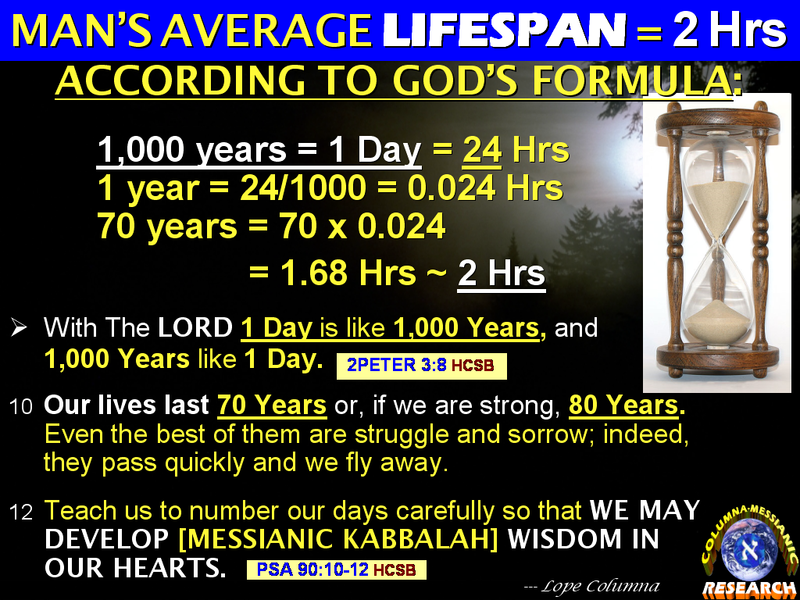 GOD GAVE MAN ONLY 70 YEARS AVERAGE LIFE SPAN, WHICH IS EQUIVALENT TO ONLY ~ TWO (2) HOURS IN THE COSMIC SENSE! If we look and search back human history for the last seventy years, we will discover that there's no record of most of us here whatsoever! It's because, seventy years ago, most of us here did not exist! God decreed in this recent time that each man and woman should live an average of only 70 years, or 80 years if you take care of your body well enough. Seventy years is not a long time, really. From where do we know that? Thus, there is an urgent need for each one of us to really appreciate and take advantage of these short life years. And we should avoid all kinds of "LIFE WASTES" while we live. Those years are even filled with sorrows and troubles. For God, this average lifespan of 70 years is only less than 2 hours! GOD'S EQUATION: 1 DAY = 1,000 YEARS. AND 1,000 YEARS = 1 DAY! We get the average lifespan of a man and woman, according to God's formula, as only 1.68 hrs, or approximately 100 minutes or 2 hours! This Life formula shows how vain and temporary we are! Truly human life is just like a vapor that is gone within minutes (Psalms 39:5, 62:9, 90:9). Or just like a flower in the field that when plucked up and expose to the sun, it withers within minutes! So, how do we spend or invest this 2 hours of existence? Should we use it in unproductive and vain political and religious debates and discussions? Should you spend your short life in getting more money, money, and all those that money can buy, forgetting the more permanent spiritual treasures in heaven? We should be wise enough to spend this short and precious time of our lives to prove our worth, loyalty and obedience to God; so we can be of creative use and service to God's Kingdom that will never end. WHAT ARE WE TO DO WITH THIS SHORTNESS OF LIFE? What is the most meaningful and useful endeavor that everyone must strive for today? 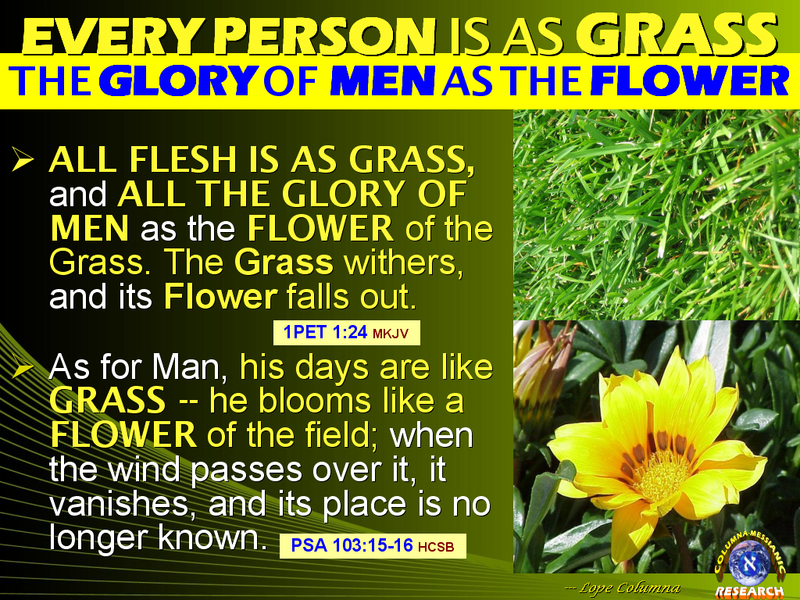 The most meaningful endeavor that you and I should endeavor today is to really know God -- the Great Creator, and to purify/transform ourselves into the Likeness and Stature of the LORD Jesus Christ! In other words, with this shortness of time, it is wise for each one of us to really work hard and make the most of this very short lifespan. There is no time for us to waste our very precious time indulging in gossip, or in the politics of this world, or in computer or the Internet games, or in gambling, or of any similar useless and vain things and activities. For additional information, go to: Please Explain What Does It Mean, TIME IS SHORT. And How Can We Spend This Short Time Remaining In A Productive Way? KNOW AND DON'T FORGET THE PURPOSE OF YOUR LIFE HERE ON EARTH! The main purpose of our existence here on earth is to develop and embed in our character the image and likeness (Tzelem Elokim) of God the Father, as modeled by Jesus Christ (Genesis 1:26). And we are given only about 2 hours to do this! Without realizing this, we could spend this precious life in vain, as most of the people in the world are doing. So, how then can we make the most of our lives? While most people spend their time in games and entertainment, why not spend most of your time and life exclusively for the LORD God, participating in His Great End-Time Elijah Work on Earth? And most especially, in studying His Divine Messianic Kabbalah Wisdom that is now available to you, and to everyone? AFTER THE 2 HOURS, WHAT KIND OF A PERSON DID YOU MAKE YOURSELF? For that short duration of about 2 hours, God expects us to acquire the FEAR OF GOD, FAITH, and OBEDIENCE to Him. That we successfully embed to our personality the Image and Likeness of God the Father. If we succeed, then we will be given ETERNAL LIFE -- the Life without end. Then we will spend the New Heavens and the New Earth, with Christ and God the Father, with the millions and millions of faithful Angels for our service. After the 2 hours or 100 minutes, what can God see in our character? An important truth that all of us must be reminded about is that: WHEN WE PASS OUT OF THIS WORLD, WE ARE TO RETURN TO WHERE WE CAME FROM IN THE FIRST PLACE. Our human fleshly body will return to dust, and our spirit or soul is to return to God. How will you appear before God, if ever you will be allowed? And how will you answer Him, with His question: WHAT HAVE YOU DONE WITH YOUR LIFE ON EARTH? DID YOU ACCOMPLISH YOUR MISSION ON EARTH? 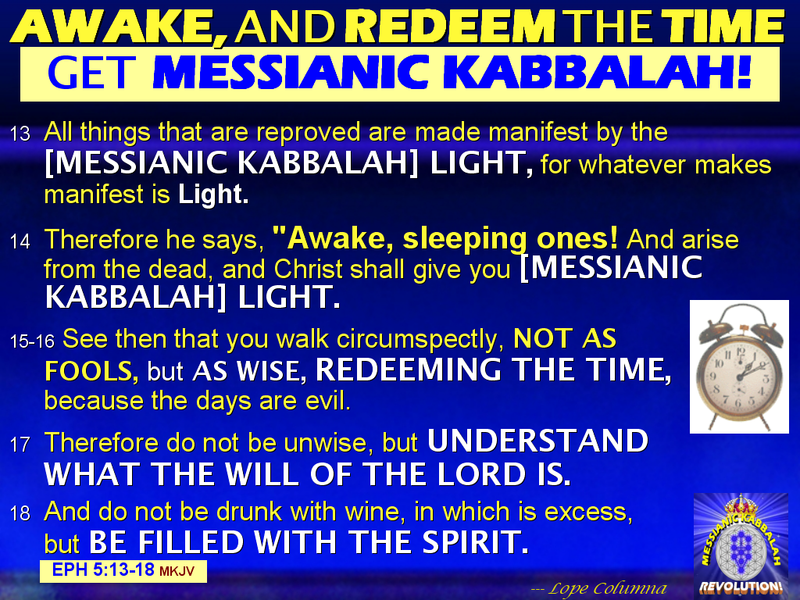 The sacred FEAR OF GOD, which is the beginning of God's Messianic Kabbalah Wisdom is the antidote to following creature idols, and vanities, whether self-righteousness or wicked oppression and other evils, or youth spent without God. "This is the whole duty of man" -- literally, it means "this is the whole man," (ang tunay na lalaki o tunay na babae) the full ideal of man, as originally designed by the Creator God. Matthew 25:21 also means that because you have been faithful and wise in using the 2-hour life God has given you, then, now, you are proven and qualified to be given ETERNAL LIFE -- the LIFE WITHOUT END, much beyond the 2-hour life given to you previously! Invest your short 2-hour life wisely, today. The profit is much greater and beyond than what this material world can offer! Continued on Part 2: The BEST INVESTMENT IN YOUR LIFE IS YOUR LIFE! it and also added in your RSS feeds, so when I have time I will be back to read more, Please do keep up the excellent job.